The Port of Oakland is about to start the construction of shore power connections at 12 of its berths, which will provide power from land to a vessel that is berthed or at the dock. Providing a land-based source of power is intended to reduce the amount of pollution from ships burning diesel fuel while they are in port. Usually berthed ships keep auxiliary engines running in order to provide power to core ship functions and to cool cargo. Shore power provides energy supplies from land and allows those vessels to “plug-in” and shut off their diesel-fueled engines. “The ship services … are powered by electricity that comes from the electric grid as opposed to the auxiliary engine,” explains Delphine Prevost, Senior Maritime Projects Administrator of the Port. By implementing shore power, the Port of Oakland aims to reduce air pollution from diesel particulate and to follow regulations set by California’s Air Resource Board. 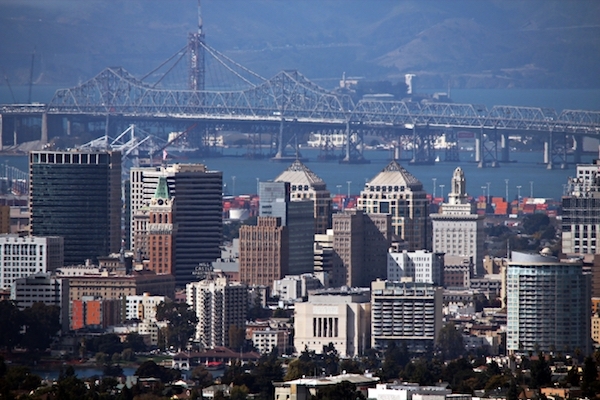 In a Maritime Air Quality Improvement Plan that was developed in partnership with the Bay Area Air Quality Management District, the West Oakland Environmental Indicators Project, and maritime industry representation, the port set a goal of cutting diesel particulate matter emissions by 85 percent by the year 2020. “It is a pretty important project to reduce emissions and get us to achieve our goals,” says Prevost. In addition to the port’s initiative, other terminal operators will also implement shore power at their berths. In a phased project, the port plans to implement shore power successively at 12 of its 18 berths. “Between now and December 2013 we are going to be installing new conduits, new cables, new substations inside the marine terminals as well as minor upgrades to the main stations,” says Prevost of the planned construction. “We are going to have the first shovel in the ground in May.” The first shore power connection is expected to be available next year. The port expects to achieve emissions reductions that exceed the amounts technically required by law. All shipping lines that the port is working with are aware of the standards used for implementing the shore power technology and Prevost believes that the majority of the vessels serving California ports will be able to plug in. The success of the project will be evaluated by Californian air quality agencies that will monitor the emission reductions on a regular basis. To realize the project, approximately $90 million of capital investment will be required until December 2013. About $40 million is expected to come from state and federal grants; the remaining $50 million will be paid for by the port, according to Prevost. The initiative will make the Port of Oakland to one of the few ports on the U.S. West Coast to offer shore power. San Francisco has implemented shore power for its cruise terminal and the ports of Los Angeles and Long Beach are currently implementing shore power solutions for container vessels. At the moment, no ports on the East Coast are using shore power. I think this is a great move for the port , eliminating pollution coming from ships is critical to the air quality and this move puts Oakland ahead of the curb . I’d like to know who foots the bill for the electrical use is it passed on to the shipping company or does the port pay it.